Frisco with its quaint historic buildings on Main Street and numerous restaurants and bars is also a very convenient and central place to stay. Find coffee houses, boutique shops, liquor stores, spa services and nightlife on Main Street. The Frisco Historic Park gives visitors a feel for the 1880’s with log buildings that were once a jail, saloon, hotel, homes, chapel and schoolhouse. And just around the corner, located on CO Hwy 9 Summit Boulevard are the modern conveniences of Safeway, Walmart, Whole Foods, Natural Grocers, Starbucks, sporting goods, snowsport rentals and quick service and full service restaurants. Frisco has the best of both worlds – charming and well-located. 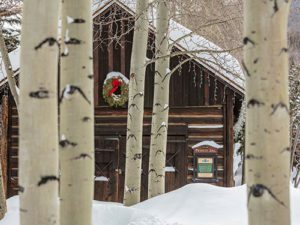 Our Frisco units are just 10 minutes to Copper Mountain, 20 minutes to Breckenridge or Keystone, 25 minutes to Arapahoe Basin and Loveland, 25 minutes to Vail and 35 minutes to Beaver Creek. 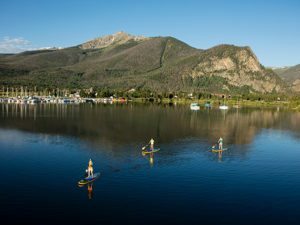 Lake Dillon is on the east side of Summit Boulevard with a full service Marina, recreation path and national forest access to the waterfront. Some of our units are located near Main Street and some are within easy walking distance of Lake Dillon. Located at the beginning of the Ten Mile Range, the town has wonderful views of mountains, the Continental Divide and Keystone Resort. 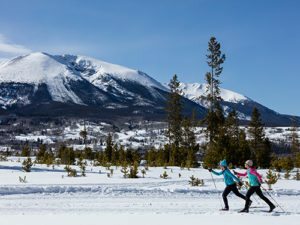 With more than 46 kilometers of trails for skiers and snowshoers of all abilities, the Frisco Nordic Center is considered one of the best Nordic centers in Colorado. Frisco has a lift-served Tubing hill and day lodge next to the Nordic Center. In the summer it becomes a challenging bike park and the Frisco Peninsula trails are used for mountain biking, hiking and a wildly popular and challenging disc golf course. Additional winter activities include sleigh-ride dinners and tours and free pond ice skating. The Frisco Bay Marina offers pontoon, sailboat, kayak, and stand up paddleboard rentals. Enjoy lake and fly fishing all along the lakefront and on the Ten Mile River. The Summit County Recreation Path flows through Frisco and connects to all of Summit County and over Vail Pass all the way down to Glenwood Springs. From Frisco you can ride around Lake Dillon, to Copper Mountain, Breckenridge, Keystone and beyond. Just 95 miles from Denver International Airport, Frisco is just off Interstate 70 Exits 201 and 203. It is central to all the outdoor activities in the area.